Our mud room/laundry room has been getting a lot of attention lately. We all of a sudden came up with a bunch of ideas on how we want to improve it. First of all, we got rid of the old baby blue color, that I thought made the mud room look dingy and it just didn’t flow or blend with the rest of the house. So we painted the room a nice cheery, pale yellow Benjamin Moore paint called Soleil. We painted our guest room that color last year, and absolutely love it. Its pale, soft, cheery, and sunshiny. And it’s not too dark and not too light. Perfect. So we thought this room needed a little cheering up too and the Soleil color did just that. And, the bigger news is that my hubby just finished building, staining, and installing some awesome custom shelving units. 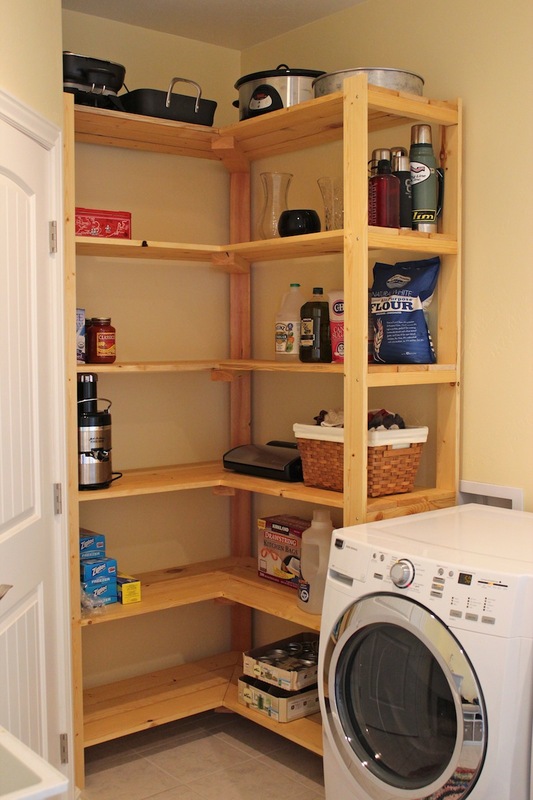 I LOVE these, they are a great use of the space, and they give me so much more storage and pantry space. 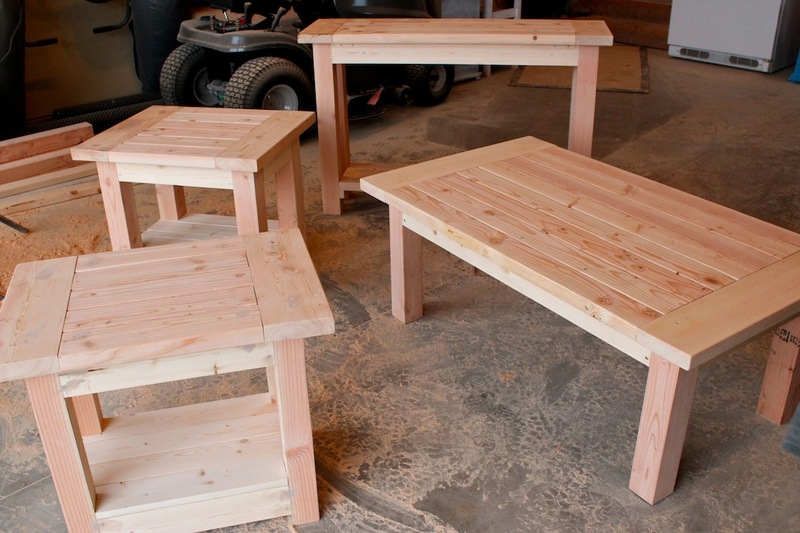 He built them with good quality pine, and we used wood conditioner and then a natural stain. We got the idea from my Aunt Connie who has shelves just like this in her mud room, then found these Williams-Sonoma shelves. I printed off the picture for Will, we took some measurements and he got to work! 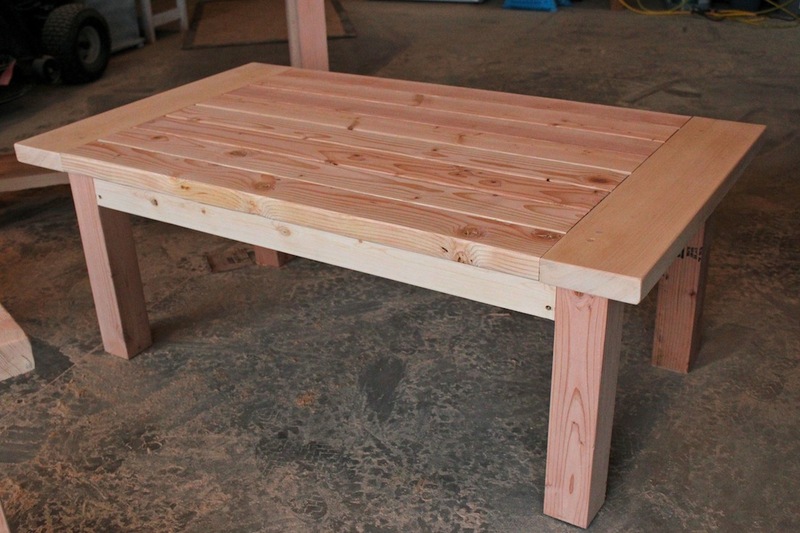 I love finding furniture plans on Ana White‘s site, and we’ve been wanting to build this Coffee Table for a while now. 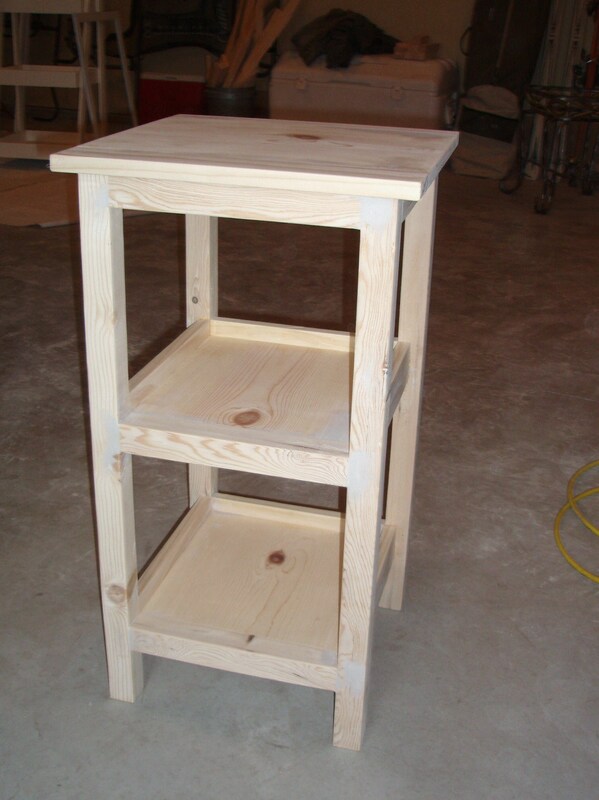 So Will got busy and built it, along with a couple End Tables and a Sofa Console to go with it. 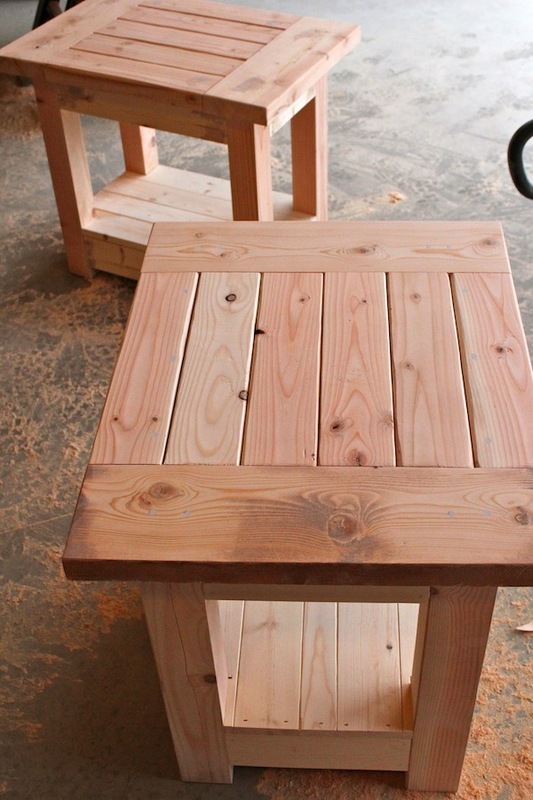 I love that they’re solid wood (Pine) and so sturdy. 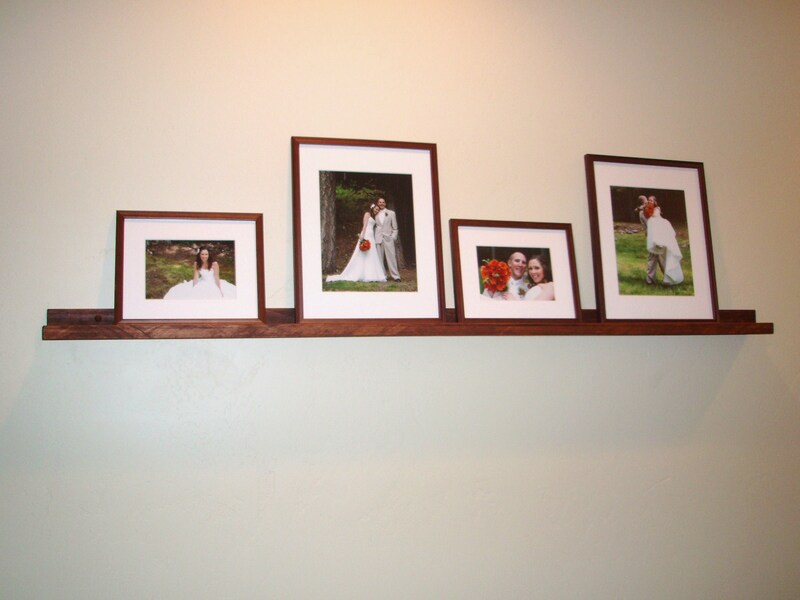 Also love that Will modified the plans a little to add on a shelf at the bottom of the end tables and the sofa table. I love the weekends where my hubby and I can just be home and eat, watch movies, and work on projects around the house. 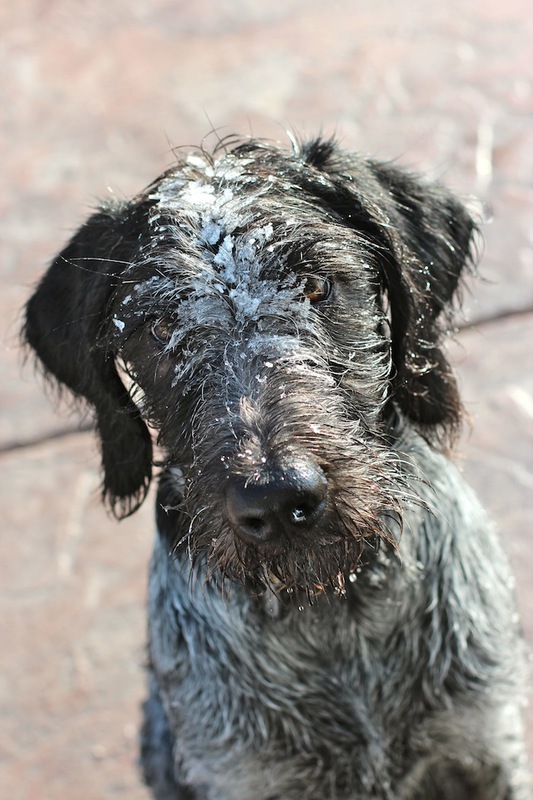 We just had one of those lovely weekends. I worked on super-cleaning the house, laundry, knitting a hat, made a big pot of Chicken Noodle Soup, and baked some more Pumpkin Chocolate Chip Cookies. 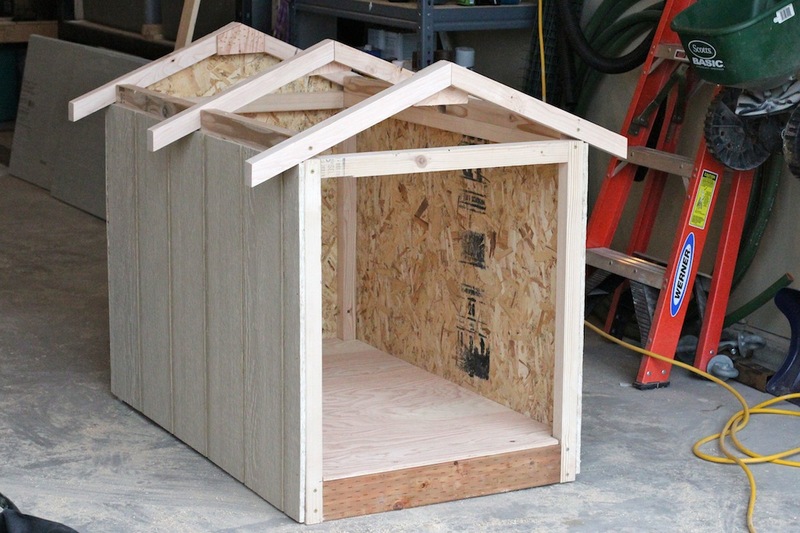 And Will built a dog house for Jack. 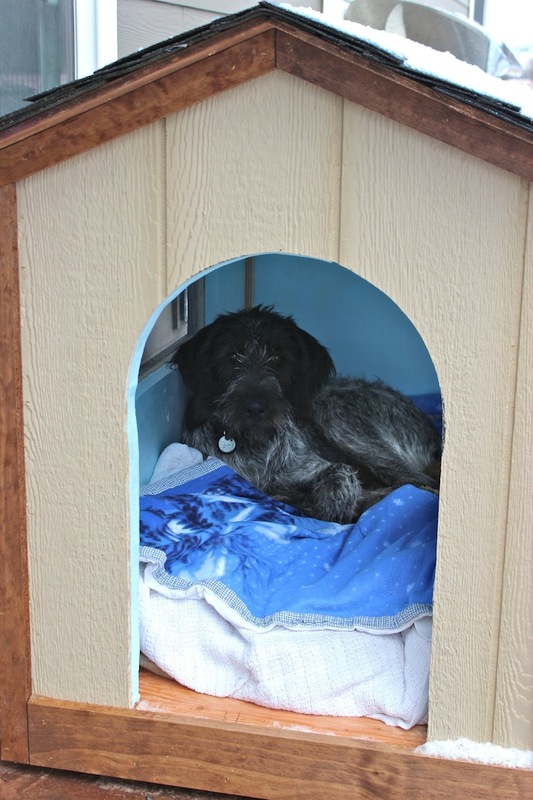 He loves getting into a good wood-working project in the garage and he really got into this one, making it nice and cozy, complete with insulation, windows, and shingles on the roof. Don’t you just love making your house a home by do-it-yourself projects, finding crafty and thrifty ways to furnish and decorate? I do! 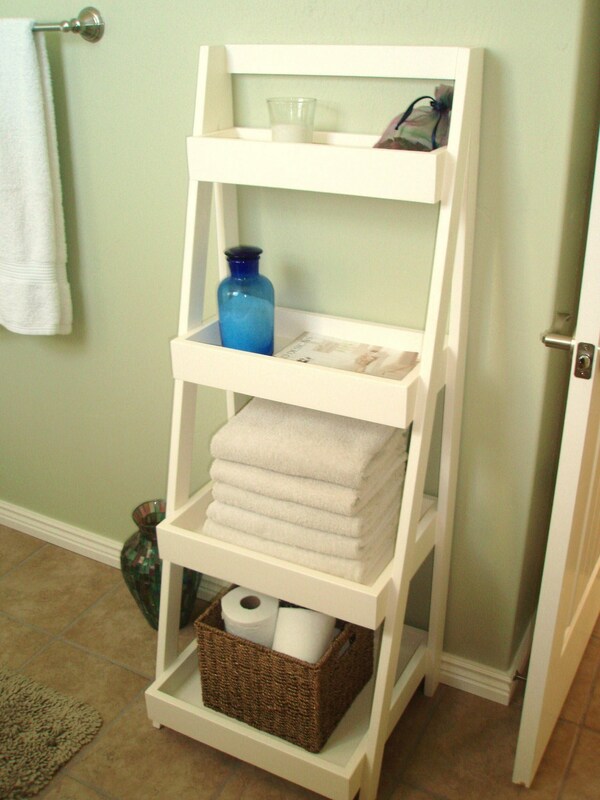 My handy husband and I finished up making our second piece of furniture, a little shelf stand for our master bathroom. Just like the last one, he did the building and I sanded, primed, and painted. So fun! 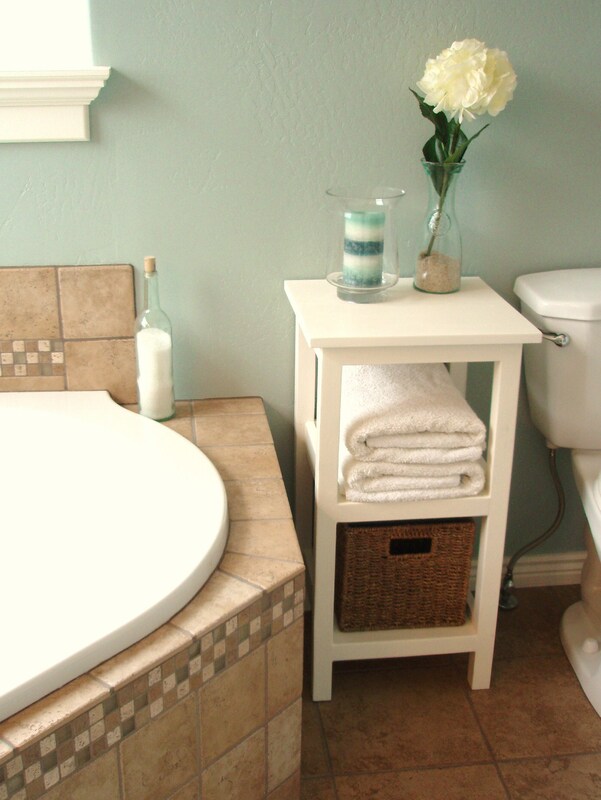 And so nice to have a more finished touch to the bathroom… And additional storage! I love this little shelf stand! I found the plan for the Bath Storage Tower on Ana White’s website. Isn’t it great? I’m thinking one with a little less wide and deep would be a perfect plant stand for inside the house. And another of the same size for the mud room, to keep a wire basket for potatoes and another basket for storing onions and garlic would be great! So many great uses. And He Can Build Things Too! 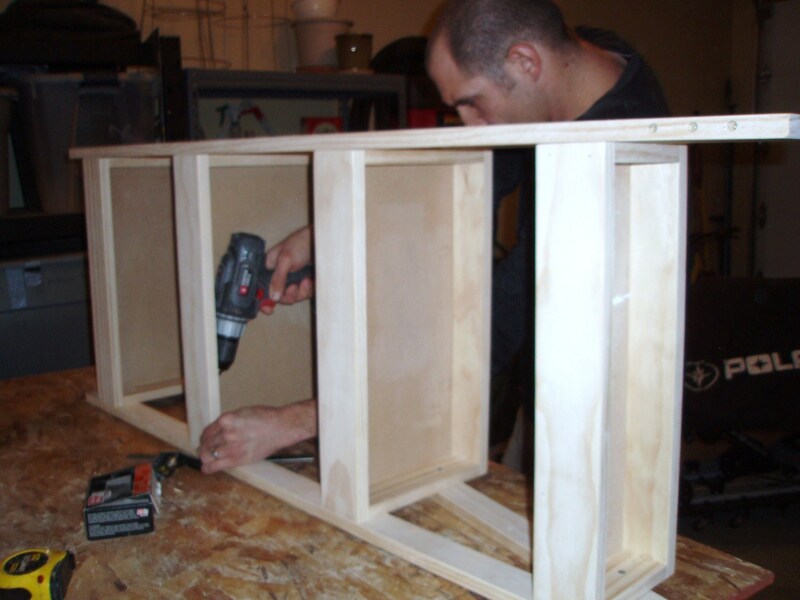 So my hubby and I have taken up a new hobby (as if I need another)… we started building furniture! Well, he is doing the actual building, I would love to say that we* are building furniture but that day will come someday soon. 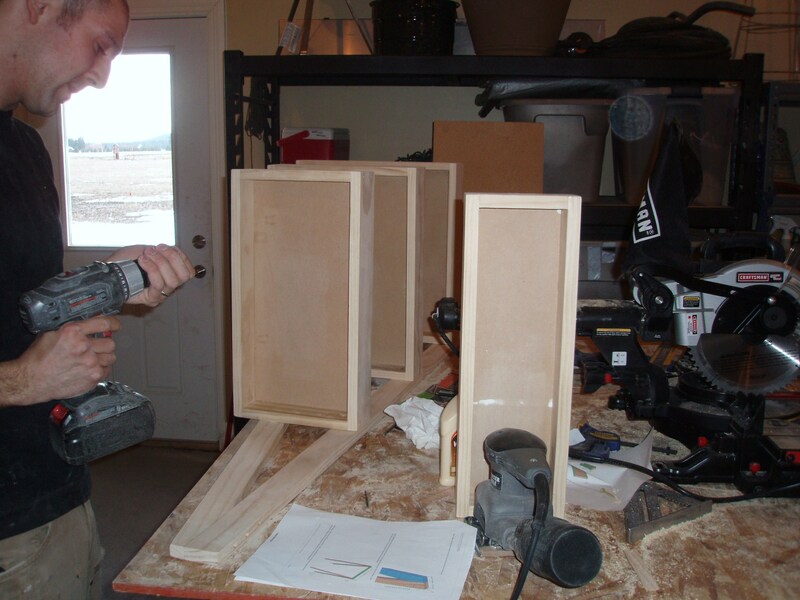 I am having him show me the ropes with the power tools and helping him a little, but I enjoy finishing the pieces… sanding, priming, and painting. This winter I came across this cool website by Ana White and found all these lovely plans and pictures for making everything from shelves and benches to nightstands and headboards, even coffee tables and dining tables. 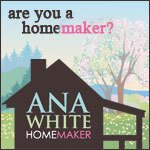 Ana White lives in Alaska and started doing some woodworking, building furniture for her own home (how’s that for an Alaska-tough DIY home maker!) a few years ago. Meanwhile, she started a blog that was called Knock Off Wood so she could share her projects and post plans, making them available to others. …For free! After a few years the blog got so big and popular, she soon had thousands of fans and people jumping on board …ha ha (no pun intended), so she created a great big website. There you can search and print building plans, and even create your own account to keep a ‘To-Do List’, share your own projects, and chat with other DIY builders. So I got excited when I found all these wood-working possibilities at our fingertips, showed it to the hubby, printed off a few plans and he got right to work! He’s pretty handy, and is enjoying the wood working projects. Soon enough it was time for me to get sanding, priming, and painting! We originally intended it to be for our master bathroom, but even though it fit in the intended space it just looked too crowded and big there. So, it has found a home in the guest bath and makes the guest bath feel a little more home-y. We’re pretty happy about it, considering Pottery Barn has the same thing: Floor Standing Ladder for $199! I love that a lot of Ana’s furniture building is inspired by Pottery Barn. I think she has great taste. 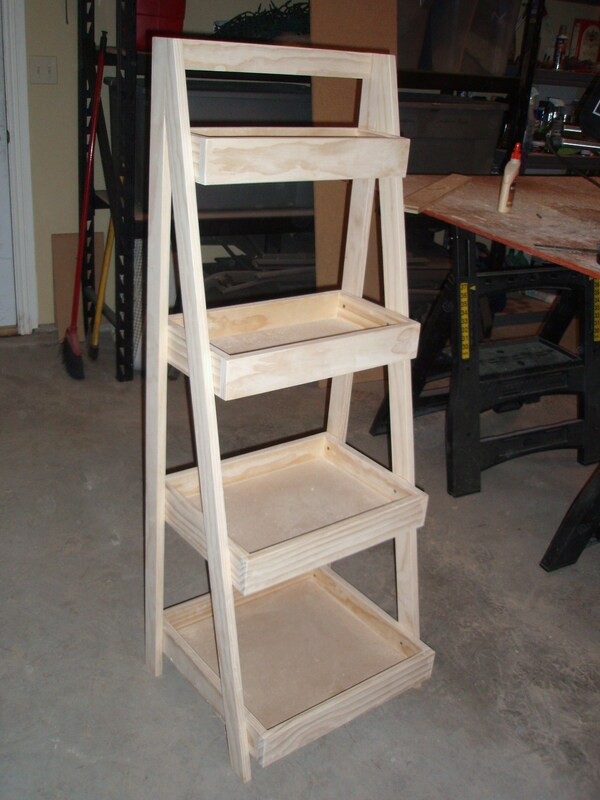 If you’d like to see the building plan and details on the materials, time, and dollars that were used to do this project you can see all that here: Our New Ladder Shelf. Want to receive notifications of new posts?